Something is wrong, now what: This article will help you figure out what went wrong, how to get started on fixing it,or now to prepare for possible crashes. Wine allows you to run programs compiled for MS Windows under Linux, FreeBSD, and NetBSD. Learn what Wine is, and how it works. 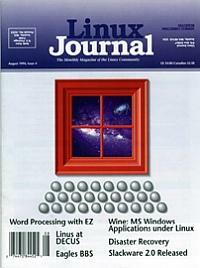 The birth of a popular bulletin board system. Linux to the rescue—crating an easy-to-use, retail subscription system.